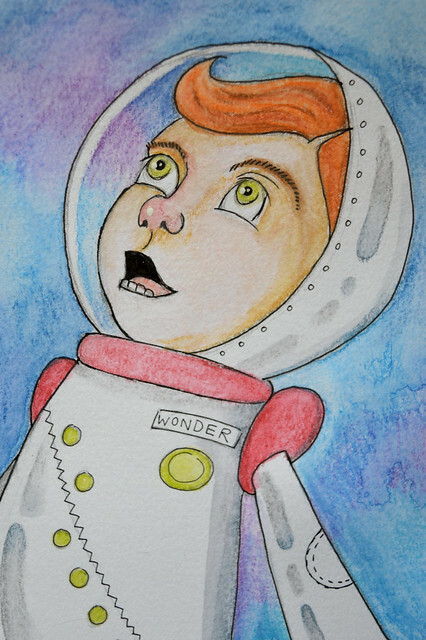 This week’s Colour Me Positive theme was all about Wonder. The supporting quotation was one Plato attributed to Socrates: “Wisdom beings in Wonder”. I really engage with that idea, that knowledge and wisdom emerges from the exploration, diligent learning, and experience that is driven by wonder, inquisitiveness and curiosity, the need to search for answers. As a bookish nerd, that really speaks to me. An additional prompt suggested adding bubbles to the page somewhere. I was at my monthly art journalling meet up group on Sunday and decided to work on my prompt page. 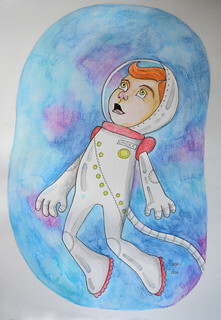 I have no idea why the idea popped into my head but I do know I was feeling in an illustrative mood so I sketched out this little figure of a child floating in space, awed and amazed and in wonderment at the universe. I hope the facial expression suggests wonder. The helmet can be a nod to the bubble prompt. As I was in a coffee shop and had my limited travel art supplies with me, this was drawn with micron pens and watercolour pencils which I activated with water once I was home. Dare I say it myself but I think this is a pretty charming little illustration and I am really rather pleased with how it turned out. The second Life Book lesson of the week turned out to be a bit of a labour of love. The lesson was taken by Tamara Laporte and the idea was to create a self-portrait as the focal image of a piece all about dreams and affirmations. As I explained recently, I am not averse to creating self-portraits as they are very good practice. However, I don’t like to work on them too frequently so I decided to make a little twist on the theme and paint a portrait of me as a child. I used a photograph of myself when I was three. That is a time for limitless dreams after all. 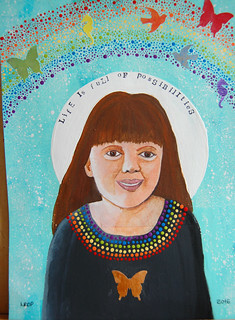 I also borrowed ideas from my own art journal page as the inspiration for elements of this painting. There were lots of layers and processes going on in this piece. Because I work in fits and starts, it felt like it was taking me ages to get it anywhere. I am not sure how I feel about this piece. I think it probably needs more work to pull it completely out of the “ugly stage” but I was in danger of turning areas into mud or pilling the paper by over-working the layers so I had to step away from it and leave it be. Frankly, I also ran out of time to devote to it. I can see that it does very much look like little me so that is a plus. I have also learned a lot from the things that went right and the things that went awry. Ultimately, I think this piece is probably too personal for me to be able to have any objectivity. 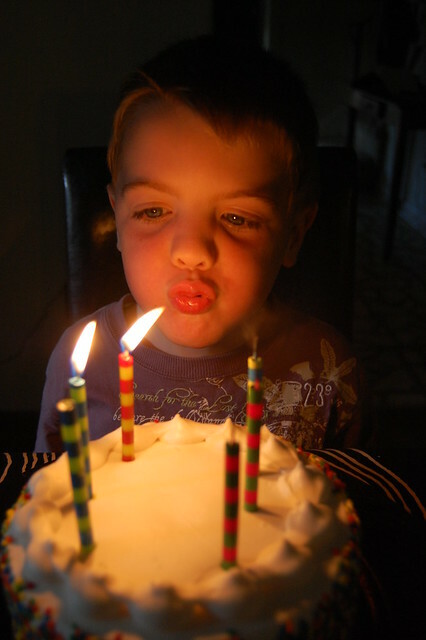 Our youngest son turned six on Tuesday. The gifts were an explosion of Minions. He’s fanatical about those crazy wee yellow guys so present after present was minion themed. 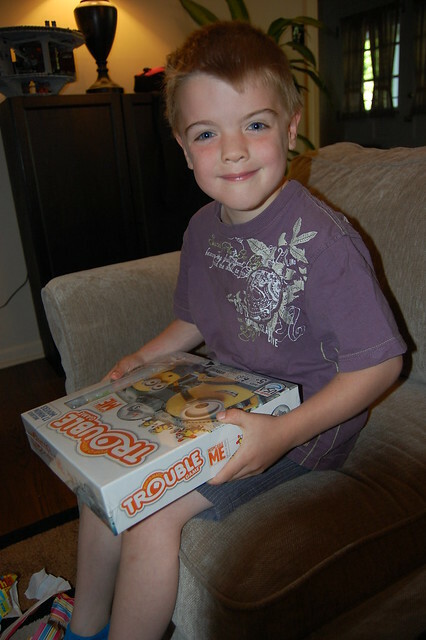 Even the cards that his brothers made for him featured minions. There were minion sets to build, minion bubble bath, a minion shaped pillow, a minion blanket an minion googles. The three gifts he received that strayed from that theme were a jumper covered in bugs and creepy crawlies, the Paddington movie on DVD and a dancing baby Groot Pop. After a day at school, during which time he distributed candy treats to his classmates, he was allowed to choose the birthday meal. He chose McDonalds. Ugh. 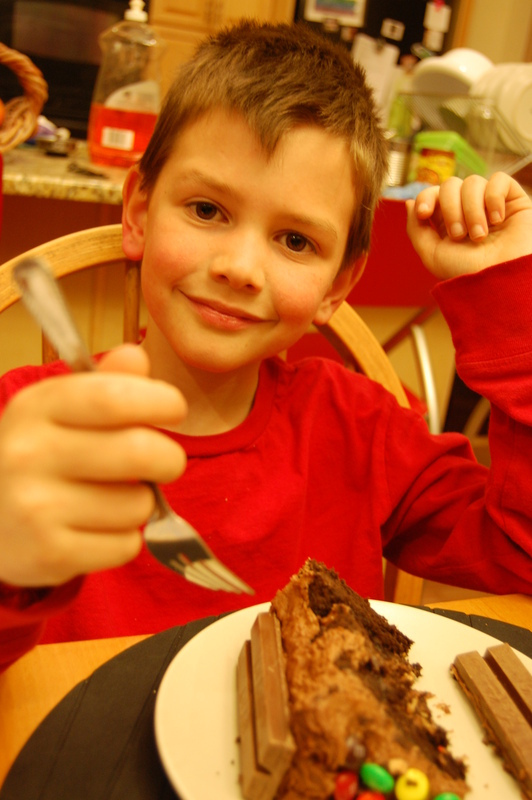 My older kids have always chosen a home-cooked meal, curry being a particular favourite, but no, this kid wanted to eat junk for his birthday dinner. As we trekked to McDonalds and munched our greasy food, I felt like a failed parent. We maybe need to look again at our birthday dinner rule. Then it was home for a cake with frosting so sweet it made my teeth curl. But the Littlest Pict had a terrific day and that was the important thing. 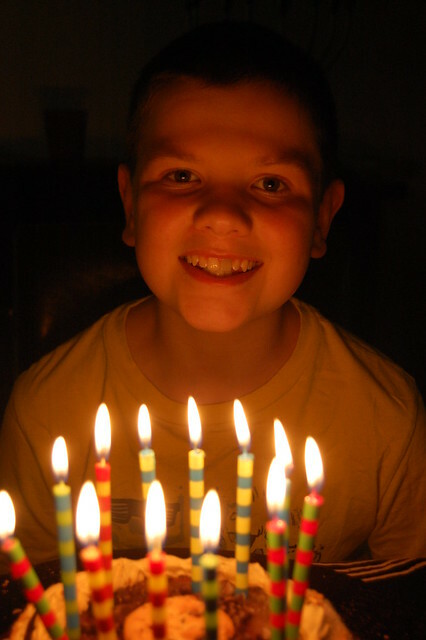 Yesterday our oldest son turned 12. It is astonishing to us as his parents how a dozen years could have passed already but they have and we now have a mere year in which to brace ourselves for becoming the parents of a teenager. 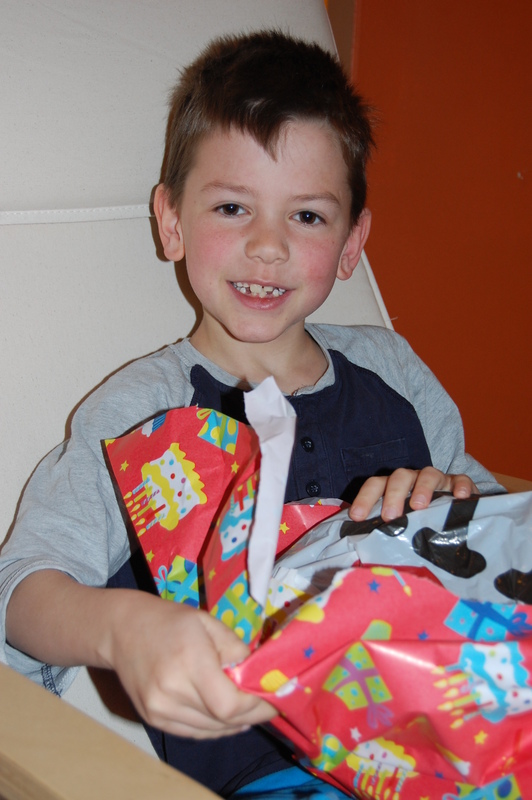 His presents included some Funko Pop figures to add to his collection, an ‘Adventure Time’ version of monopoly, a pop-up book of Poe stories, some video recording software and a whole bunch of bacon themed items because he has recently become fanatical about bacon. Unfortunately he not only had to attend school on his birthday but had state tests to take. Exams are not an ideal way to celebrate a birthday but we tried to make up for it by letting him choose what we would eat for dinner. He asked if we could go to Wawa to order hoagies. Wawa is like a roadside convenience store, a rival of 7/11, and they have these little touchscreens where you can select the ingredients of a hoagie – or order other food – and then it is made up for you. My kids are definitely small town, rural kids because they still get excited by lifts (elevators) and escalators – you would think they were fairground rides – and the technology involved in getting to construct a sandwich seems to be entertainment for them too. They have only been allowed to do it twice before so we went with it as a birthday treat. This meal of hoagies was then followed by a celebratory ice cream cake. The ice cream cake did not contain bacon. 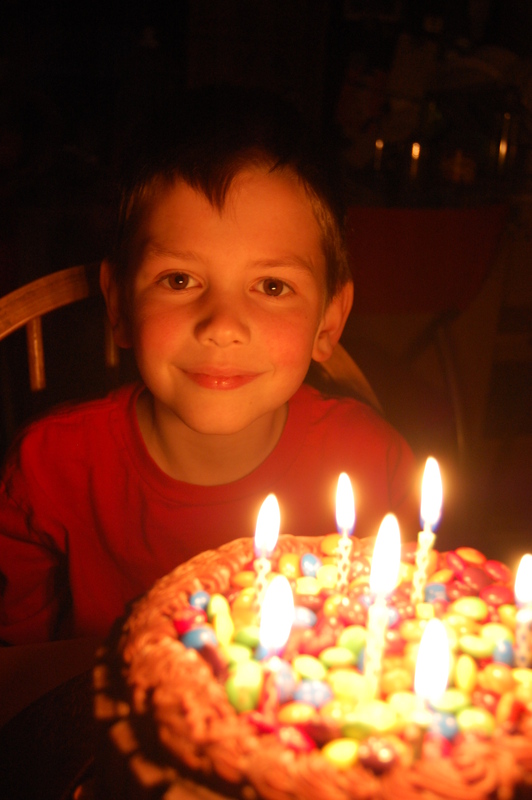 My third oldest son had his birthday on Wednesday, going from 7 to 8. 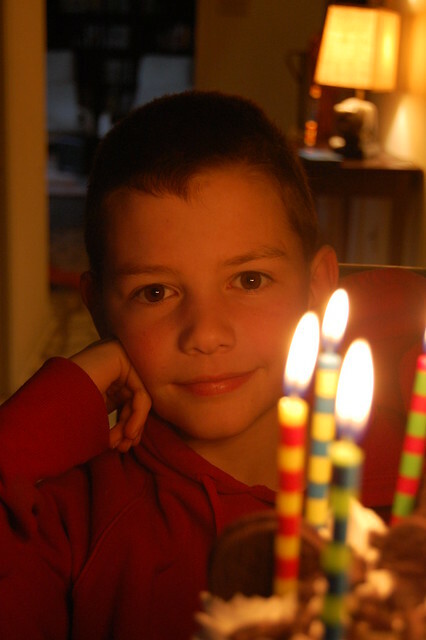 Back home in Scotland, his birthday always fell during the Easter break from school. Two American birthdays in and he is still entirely miffed that he has to go to school on his birthday. We all got up before the larks in order to all be together while he opened his presents before everyone headed out to school and work. I have never seen my kids get out of bed so quickly on a cold, dark morning. They practically bounded. Just as with his father, there was plenty of geekiness in evidence with regards to the birthday gifts. He collects ‘Nightmare Before Christmas’ figures so he got a couple more of those and a Funko Pop vinyl figure of Stitch, an Islamic Art colouring book and a set of horse tattoos, cuddly raccoon and a cuddly armadillo added to his massive collection of cuddly animals. We had to get an educational gift in there so he got a circuit building kit. He got Spiderman and Nova Marvel Infinity figures for the video game the kids have. He almost exploded with excitement when he unwrapped the Lego Gorilla Grod set. His major present was a subscription to Marvel Collector Corps. Every second month, for six months, he will get a parcel in the post that contains lots of Marvel themed goodies. Now he gets to plague me every day asking when his first box will arrive. 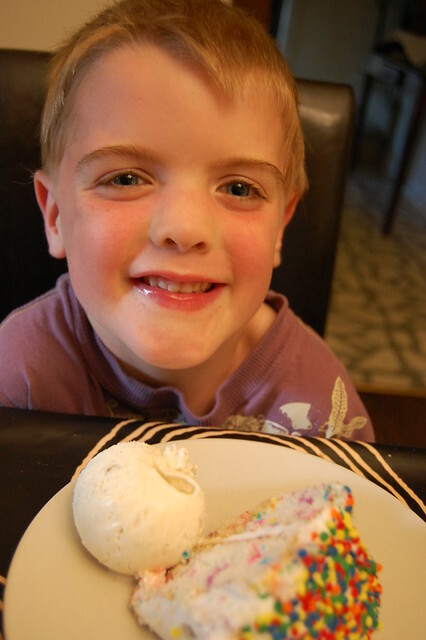 He chose pizza for dinner and then it was time for the birthday cake. This time it was an oreo cake. It was rich and very indulgent and the kids devoured their slices. I would say that was a massively successful birthday – despite having to go to school. 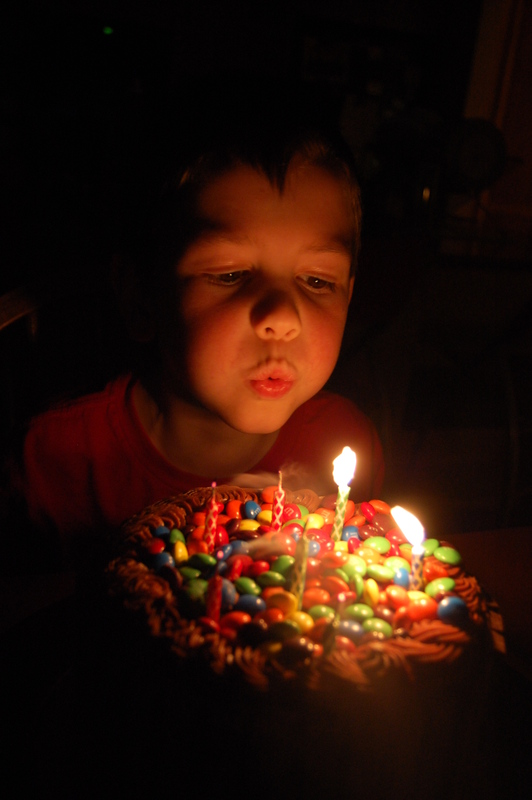 Yesterday my six year old became seven, the first of our children to have a birthday in America. It was actually a birthday of other firsts too since it was also his first ever birthday on a school day (as spring break is a fortnight long in Scotland) and it was also his first ever birthday celebrated without his Daddy since Mr Pict is in San Francisco for work this week. Sucky timing. 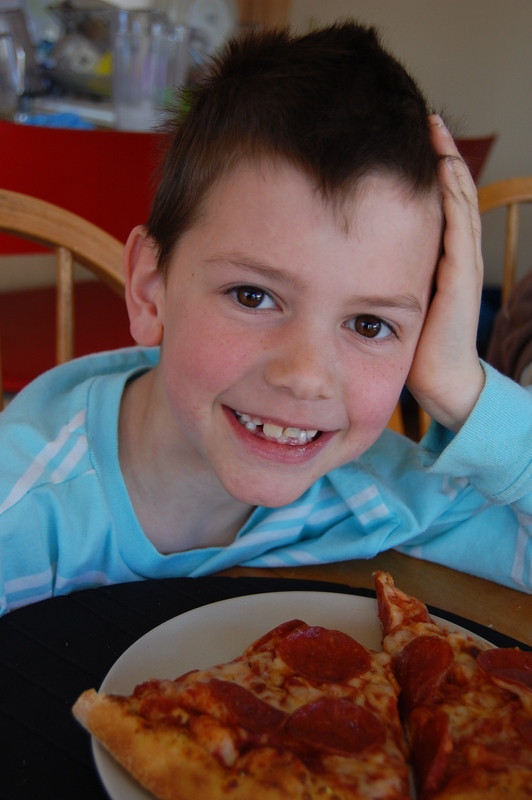 We did, however, have takeaway pizza on Sunday before he left since pizza is the birthday boy’s favourite dinner. Since it was a school day birthday, we were up with the larks in order to ensure that all gifts and cards were opened before it was time to trail out the door to school. Despite being bleary-eyed everyone bounced out of bed to watch their brother unwrap his gifts and read his cards. The gifts were a Batman Lego set, two Iron Man figures, horse and shark modelling kits, a cuddly King Kong, a glow pet unicorn and a voucher to go for a horse riding lesson. 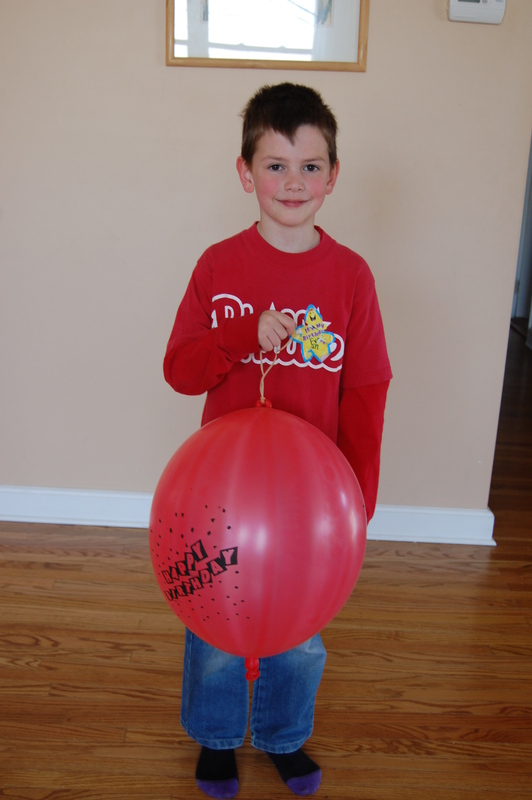 Ultimately he didn’t mind going to school on his birthday for the first time as the class had a little celebration (a classmate was sharing his birthday) and the janitor gave him a bounce balloon as a gift. Birthday dinner was quesadillas followed by the Richest Cake In The Universe. 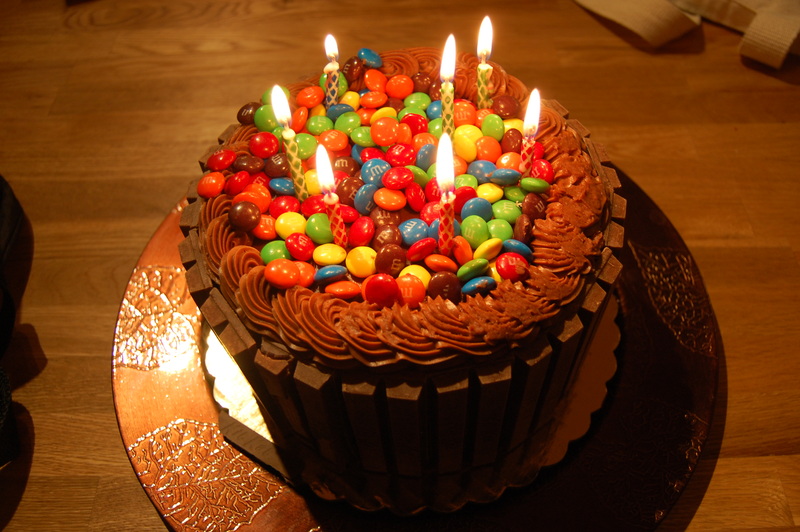 This was a sticky confection of chocolate cake, chocolate ganache, chocolate frosting, Kit Kats and M&Ms.